The Formatt 105mm Graduated Skyfire 1 Filter is one of the most widely used category of filters. It enhances reality, adding a touch of subtlety or drama to the image. 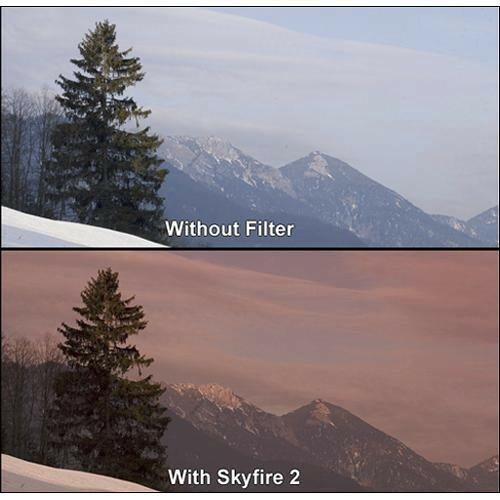 The Skyfire filter is a more intense version of the Sunset filter. Colors are more saturated. Sunsets will be even more vivid than with the Sunset filter. Often it is necessary or desirable to balance the light intensity in one part of a scene with another. This is especially true in situations where you don't have total light control, as in bright contrasty landscapes. Sometimes it is also desirable to add color to part of the photograph. For example, to add blue to only the sky. Formatt Color Graduated filters are half-color, half-clear, with a graduated transition for blending into the scene. They are available in an array of colors. Soft/hard indicates the degree of transition.